If a patient is well and in complete remission, and myeloma is his only medical condition, the most likely course is a stem cell transplant. This procedure offers a chance for durable remission of this disease. Stem cell transplant consists of putting into a patient — for example, a patient with myeloma — some cells called ‘stem cells’. 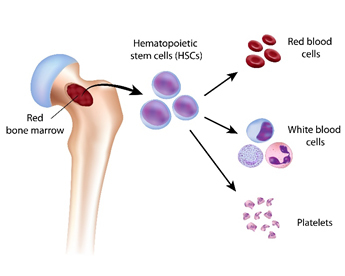 Stem cells are normally in the bone marrow, which is the red tissue inside the bones. The stem cells are the ‘mothers’ of the whole blood cells. A stem cell divides into more cells and throughout this process its ‘daughter cells’ will be differentiated into one of the types of blood cell: some of them will end up as red blood cells, others as white blood cells and others as platelets. These stem cells can be easily recognised and isolated because they have a specific marker on their cell surface called CD34 (Cluster of Differentiation 34). Myeloma is a cancer of the bone marrow in which the tumoral cell is a type of white blood cell called a plasma cell. In this case, the bone marrow does not produce normal plasma cells. These abnormal plasma cells prevent the production of normal red blood cells (inducing anaemia) as well as platelets (inducing thrombocytopaenia with an increased risk of bleeding) and they also induce bone lesions. Therefore, the goal is to get rid of these abnormal malignant plasma cells. Besides standard chemotherapy and the targeted drugs, stem cell transplantation is another option. There are two kinds of transplantation. The first one is called autologous stem cell transplantation. This process consists of first eliminating all tumoral cells with high dose chemotherapy and then putting back the patients’ own stem cells into their body to start to produce blood cells again. In this procedure, there is no immunological conflict. The patient receives his own stem cells into their own body. The second procedure is fundamentally different and is called allogeneic transplantation. The beginning of the procedure is similar: the patient receives a high dose of chemotherapy to eradicate most of the malignant cells but also the good ones. Then the patient receives the stem cells from another person, either from a family member or from an unrelated donor. In any case, even if the patient and the donor are really matched, the patient does not receive his own stem cells and because of that there is always some kind of immunological conflict. Although this rarely occurs, the patient (recipient) could reject the donor cells. Other possibility is that the donor cells will attack some part of the patient’s body. This is much more frequent and is called graft versus host disease. Another important difference between the two procedures is that allogeneic transplantation transfers specific cells from the donor with the capacities to eradicate tumour cells which are not present in the autologous procedure. The two types of transplantation are not mutually exclusive. The patient may undergo autologous stem cell transplantation followed by an allogeneic transplantation. Stem cells are mainly in the bone marrow and it is possible to obtain them by puncturing the bone marrow (inside a bone called the iliac bone, located at the top of the hip). But it is also possible to obtain stem cells by puncturing a vein (i.e. from peripheral blood) after a special treatment, and from umbilical cord blood. Currently, the most frequently used stem cell transplant is from cells obtained in peripheral blood. To do this, before proceeding to the extraction of blood, the bone marrow is stimulated in order to produce more stem cells, and so that more of them pass into peripheral blood. After that, blood is extracted, and the stem cells are separated from the blood and stored. An autologous transplant: the stem cells are from the patients themselves. An allogeneic transplant: the stem cells are from another person, a donor. A syngeneic transplant: the stem cells are from an identical twin. The compatibility of transplanted cells is very important. It is complete in autologous and in syngeneic transplants. But for an allogeneic transplant it is necessary to select a donor whose cells are compatible with the cells of the person who is going to receive the transplant (the recipient). That is why it is necessary to look for a donor with an HLA (Human Leukocyte Antigen) system compatible with the recipient’s HLA system. The HLA system exists in each person to recognise what is their own and what is not their own. The search for a donor starts with the patient’s relatives, because there is a greater probability of similar genetic characteristics, and one of them could be compatible. But alternatively, there are bone marrow banks and umbilical cord blood banks to look for a donor in case of non-compatibility with a relative. For an autologous as well as for an allogeneic transplant, the myeloma patient should first be in remission from the disease. To achieve that, the patient receives therapy to destroy the myeloma cells, with some medicines (dexamethasone, melphalan, prednisone, thalidomide, etc. ), depending on each case. The patient, once in remission, or the donor (in case of an allogeneic transplantation) receives treatment with G-CSF (granulocyte colony stimulating factor) to stimulate the production of stem cells by the bone marrow. 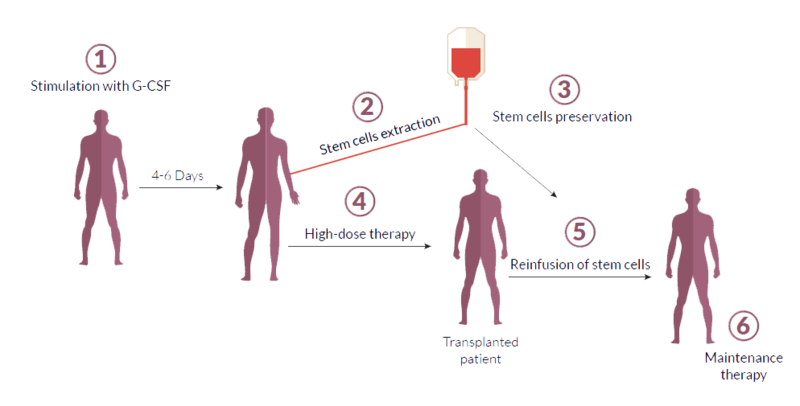 After 4-6 days, blood is extracted from a vein, and then stem cells are separated by a special machine (the procedure is called leukapheresis) and stored at a low temperature until the transplant is performed. After that, the patient is treated with high-dose chemotherapy (called conditioning regimen, mainly high dose melphalan) a few days before receiving the stem cell transplant, to eliminate all bone marrow cells, the bad remaining cancer cells as well as the good ones. After this therapy the patient has no immune cells to defend against possible infections; and this is why the patient will be kept for some time (2-3 weeks) in a protected area (sterilised room) and will need some antibiotics and other medicines, to prevent infections. Finally, the stored stem cells are put into the patient through a vein one or two days after the high dose chemotherapy was given. The stem cells will go spontaneously into the patient’s bone marrow, and there, they will start to divide and produce new blood cells. The bone marrow will normally produce new blood cells approximately 15 days after the transplant. Therefore, the transplant procedure not only eradicates the remaining tumour cells but it also decreases dramatically the length of time when the bone marrow stops producing blood cells after the high dose chemotherapy (this period is called “aplasia”). This stage lasts around 2-3 weeks, while without reinfusion of stem cells it will last 3 months. According to the European Myeloma Network, only certain patients with myeloma can receive a stem cell transplant from a donor. In this case, stem cells are extracted from the donor (HLA-compatible: cells from a relative or from a bank of bone marrow or umbilical cord blood), and the rest of the process is the same as for an autologous transplant. In this case, a patient who is going to receive a transplant of stem cells from somebody else will have, before the transplant, some immunosuppressive medicines (such as ciclosporin or methotrexate) to prevent the rejection of transplanted cells. There can be side effects caused by the different medicines received at each stage of the process: before, during and after the stem cell transplant. There is a possibility of transplant failure, when no new blood cells are produced after the stem cell transplant. When the stem cells come from a donor, there is a possibility of rejection. Will I need any treatment after the transplant? After an autologous stem cell transplant it is recommended to follow a maintenance therapy. It is usually a ‘gentle’ therapy for a prolonged period, for example with thalidomide, lenalidomide or bortezomib. After an allogeneic transplant (stem cells from a donor), the patient will need therapy with immunosuppressive medicines to prevent the immune cells of the patient from rejecting the donor’s cells, and to prevent immune cells of the donor from attacking the patient’s cells. Harrison’s Principles of Internal Medicine. 19th Ed. 2015. Engelhardt M, Terpos E, Kleber M, Gay F, Wäsch R, Morgan G, et al. European Myeloma Network recommendations on the evaluation and treatment of newly diagnosed patients with multiple myeloma. Haematologica. 2014;99(2):232–42. Mohty M, Harousseau J-L. Treatment of autologous stem cell transplant-eligible multiple myeloma patients: ten questions and answers. Haematologica. 2014;99(3):408–16.